Parque Nacional de los Glacieres is located in the southern Santa Cruz province, and offers a whole new category of trekking. The massive Perito Moreno is one of the largest glaciers in the world that offers trekking adventures that take place on solid sheets of ice. 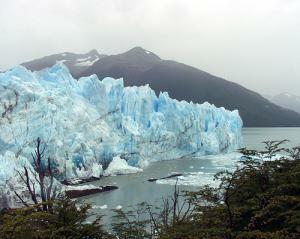 The sights, the experiences, and the sounds of the glacier will be unlike any other that can be found in Argentina. Hostel del Glacier is in the neighboring town of El Calafate and offers ice climbing and trekking services that range from a simple hike in the forests surrounding the glaciers, all the way up to a super-trekking expedition where you will bust out the crampons, ropes and harnesses. Exploring the caves and crevices that make up these giant blocks of ice is to explore another type of world and the ice climbing itself is an experience you will never forget. The small town of El Chalten is another part of the Santa Cruz province which is commonly referred to as the Trekking Capital of Argentina. Some of the most stunning views of Argentina and the Andes Mountains are in this area but can only be reached on your own two feet which makes trekking a must. El Chaltén has also been known as the “smoking mountain” because it is typically covered with a large cloud that looms over the peaks up above. 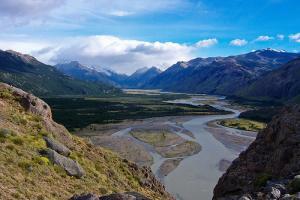 The smoking mountain was once considered sacred to the indigenous tribes of Argentina. 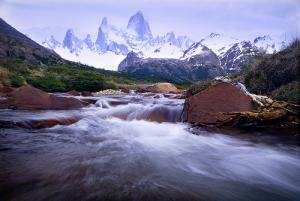 The largest and most infamous of these peaks is Cerro Fitz Roy. A successful summit to the top is more commonly heard of at Mount Everest than it is at Fitz Roy due to the recurring stretches of granite faces, the unpredictable and inclement weather, and the high skill and professional level of climbing that is required. However there are so many different trekking options in this National Park available to every type of person. Whether a day-hiker or a serious mountaineer, all people and skill levels will be able to find just what they are looking for. Needless to say, it is an amazingly beautiful experience regardless of the degree of difficulty in hike. From November – February, during Argentina’s summer months, the mountains are full of trekkers of all levels and experience. One of the best ways to enjoy Cerro Fitz Roy without summiting to the top is on an incredible 8 hour trek that takes place from the base camp Rio Blanco and the Capri Lagoon. From there a challenging 450 meter ascent will get you closer and closer to the best view in the park of Fitz Roy and the Piedras Blancas Glacier that is just one additional hour along the path. This hike is difficult but it will without a doubt leave you feeling a trekking high like you have never felt before. 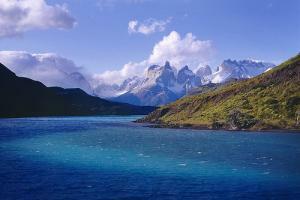 Another great trekking option that is an easier degree of difficulty is trekking around Laguna Torre. The four hour trek follows a path with incredible panoramic views of Cerro Torre, Adelas, Solo, Grande and Standhart spread along the way. After four hours of hiking, the lagoon with appear in the middle of the forest, along with the Padre de Agostini campsite. From there trekkers can choose to stay the night, head back on their return trip, or continue on and up into the mountains for more. This site is the base for many large expeditions that will summit the peaks and adventure through the surroundings. Right across the border sitting on the Chilean side of the mountains, is another impressive trekking site – the Torres del Paine National Park. This area features similar incredible views of sky high rocky peaks and endless trails for any and every person. This National Park is right outside of Puerto Natales and Punta Arenas, and although it is in Chile, it would be a shame to pass up if already in the area. Numerous tour operators can be contacted within the two towns for specific trekking information. It would be impossible to cover all of the hikes, refuges, camp sites, and hotels scattered within these beautiful landscapes of the Argentina trekking capital, but this will give you a good start. Given a few days or a week, the best way to maximize your experience is to stop by one of the main tourist agencies in town, buy a map, decide what part of the park you want to see, check out the locations for lodging and, and trek until your legs will no longer hold you up. There are various travel agencies within El Chalten that can help you out and get you started; or for more information call (02966) 422702, Río Gallegos. And for information on trekking within Torres del Paine National Park try contacting Ventisur at (61) 410047 in Puerto Natales or Mara Patagonia at (61) 710026 in Punta Arenas. This page rendered in 0.412 seconds.